1. 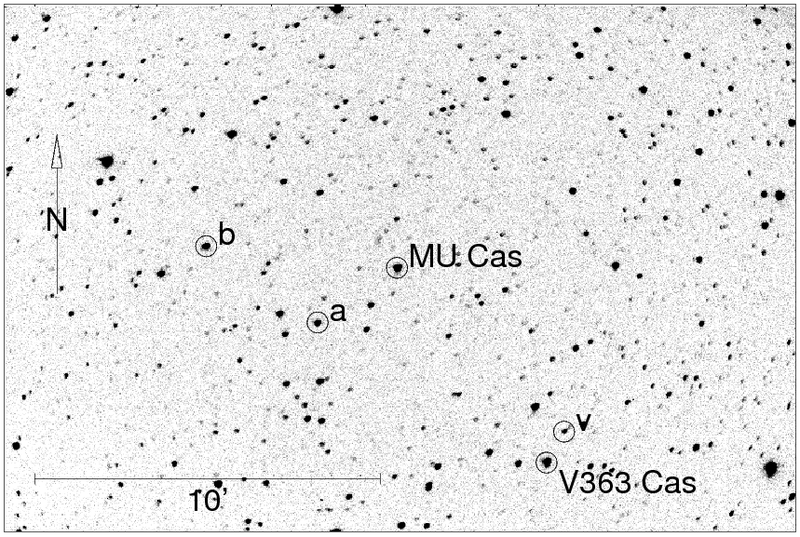 In the field of MU Cas and V363 Cas, discovered in 2009. 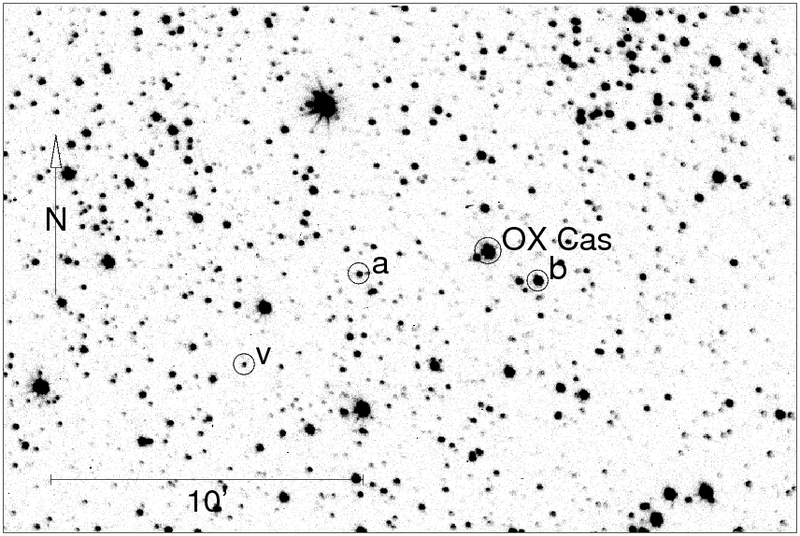 Comparison star: a = GSC 4014-01167. 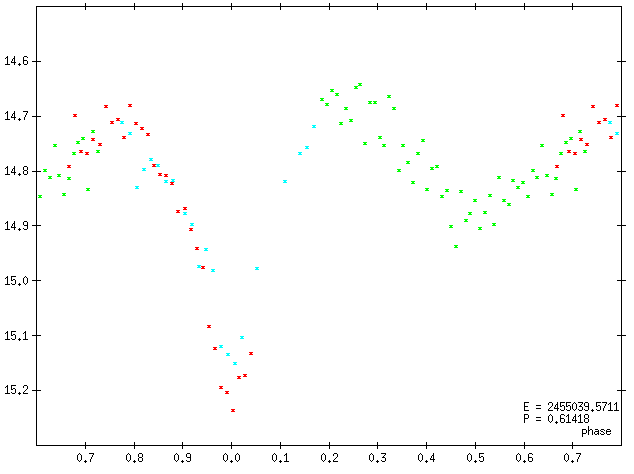 Check star: b = GSC 4014-00807. Four maxima could be observed in 2009. 2. In the field of BH Cas, FQ Cas, FR Cas and V378 Cas, discovered in 2008. Comparison star: a = GSC 3665-01829. Check star: b = GSC 3665-00016. Six minima could be observed in 2008 and 2009. MinII = 12.87. 3. In the field of OX Cas, discovered in 2007. Comparison star: a = GSC 4030-00787. 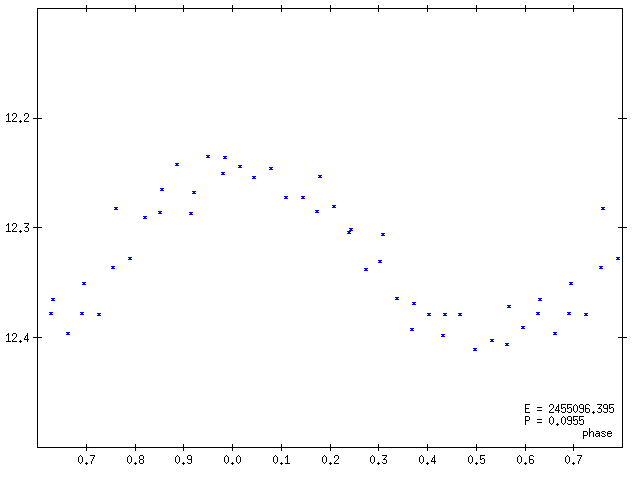 Check star: b = GSC 4030-00176. 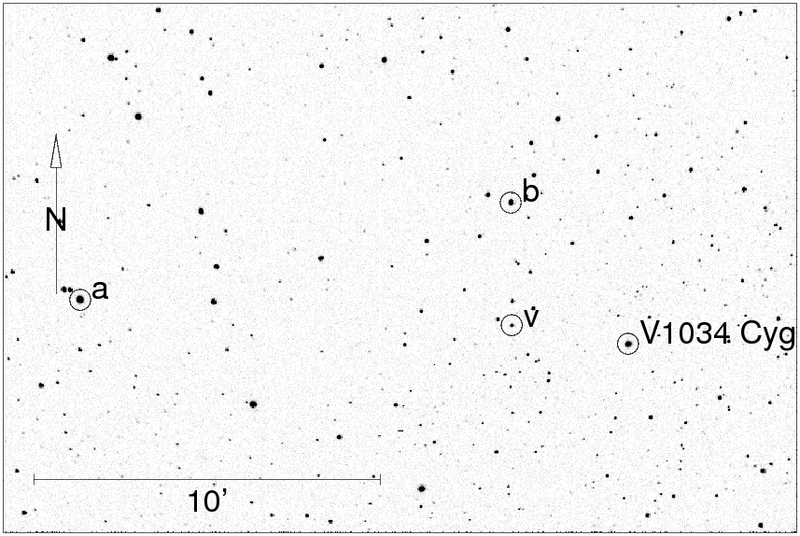 Six minima could be observed between 2005 and 2009. MinII = 14.93. 4. In the field of RY Per, discovered in 2008. Comparison star: a = GSC 3300-01410. Check star: b = GSC 3300-01123. Three maxima could be observed on one night. 5. 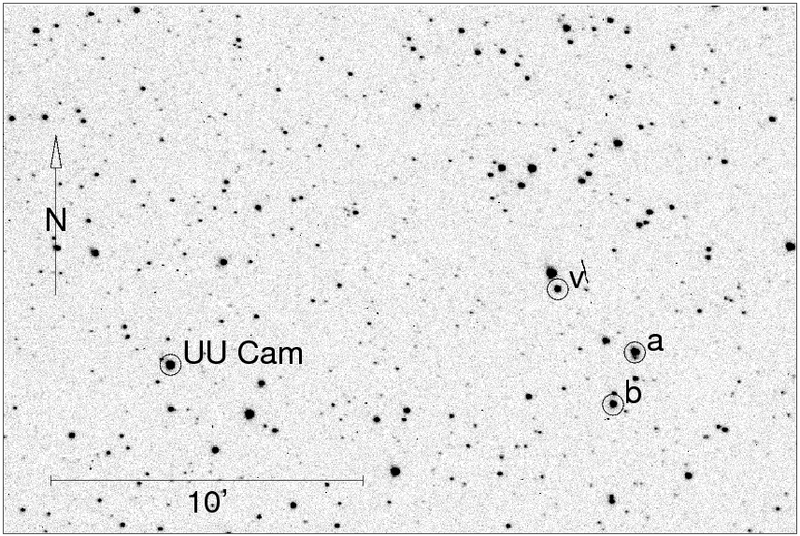 In the field of UU Cam, discovered in 2009. Comparison star: a = GSC 4339-00750. 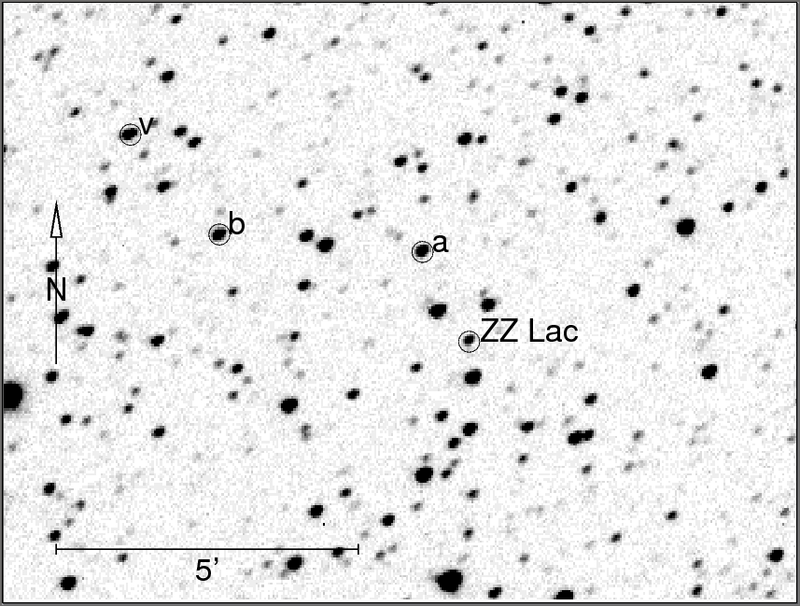 Check star: b = GSC 4339-01690. Two minima could be observed in 2009. MinII = 12.80. 6. 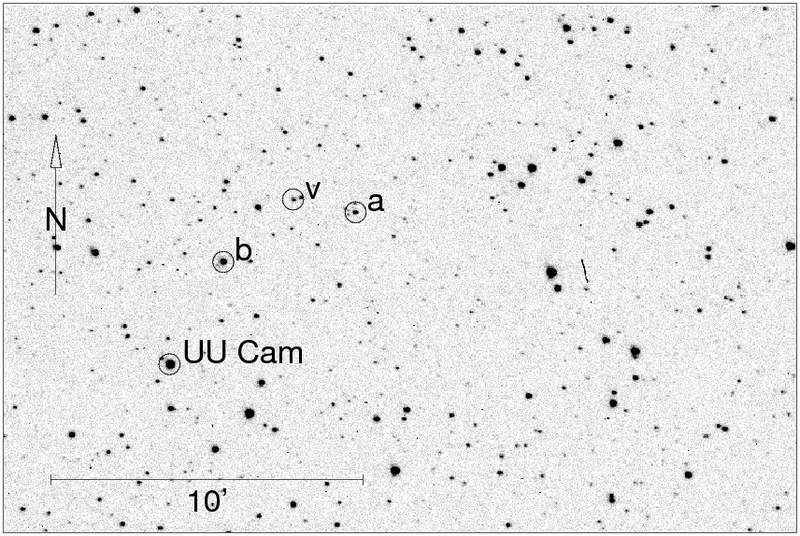 In the field of UU Cam, discovered in 2009. 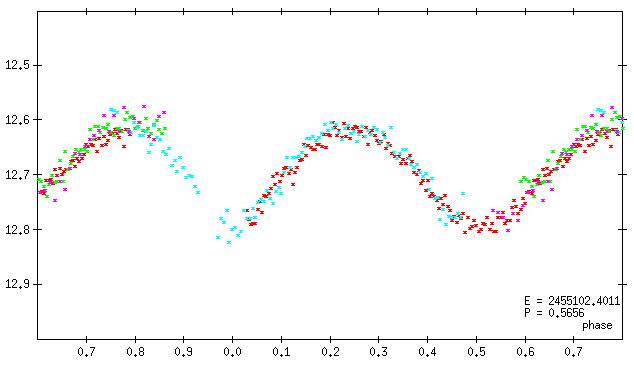 Comparison star: a = USNO-B1.0 1646-0035082. Check star: b = GSC 4339-02101. 7. 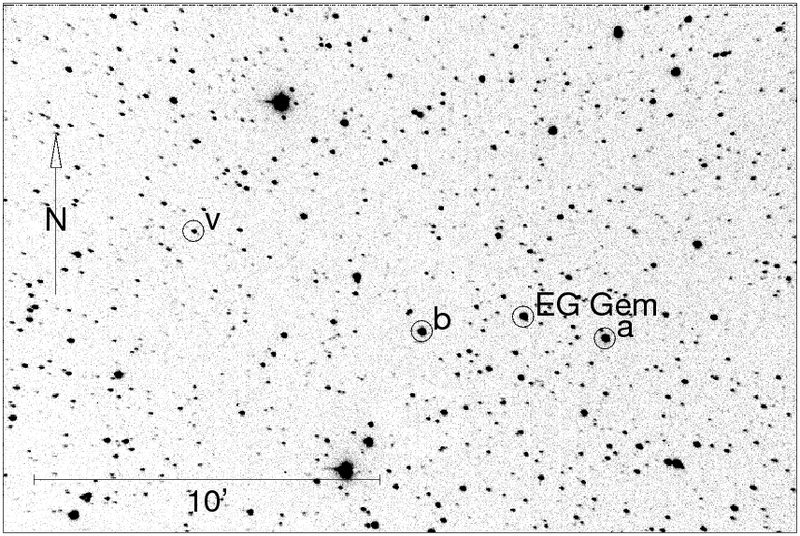 In the field of EG Gem, discovered in 2009. Comparison star: a = GSC 0760-01254. Check star: b = GSC 0760-01150. Four minima could be observed in 2009 and 2010. MinII = 14.55. 8. In the field of RZ Cnc, discovered in 2007. Comparison star: a = GSC 2484-00376. 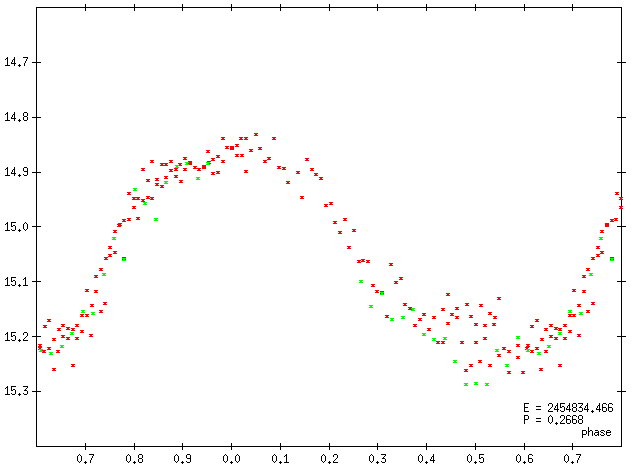 Check star: b = GSC 2484-00324. Three minima could be observed in 2007 and 2008. MinII = 14.17. The tabulated period is not the only possible one. 9. In the field of GM Boo, discovered in 2009. 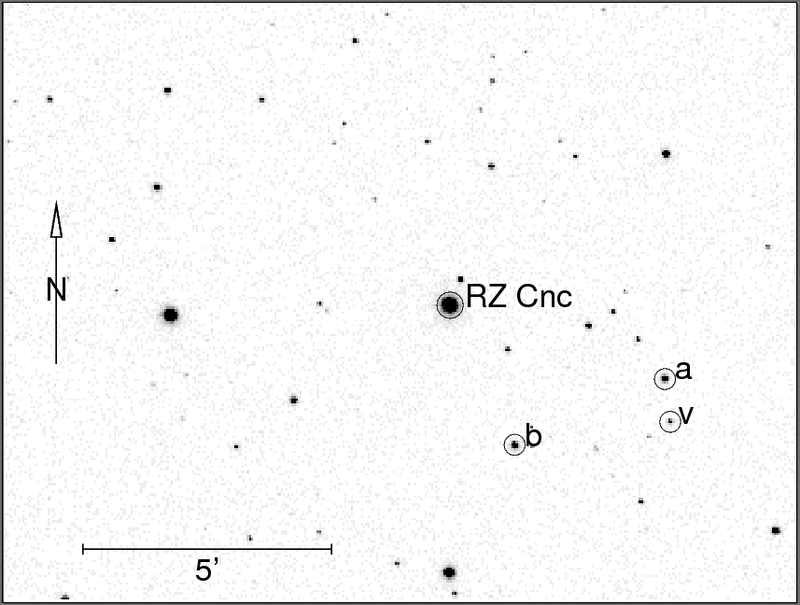 Comparison star: a = GSC 2016-00812. 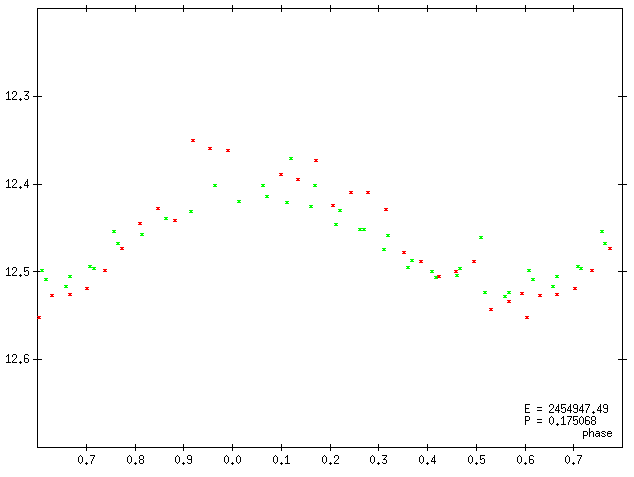 Check star: b = GSC 2016-01086. Five minima could be observed in 2009. MinII = 12.72. 10. 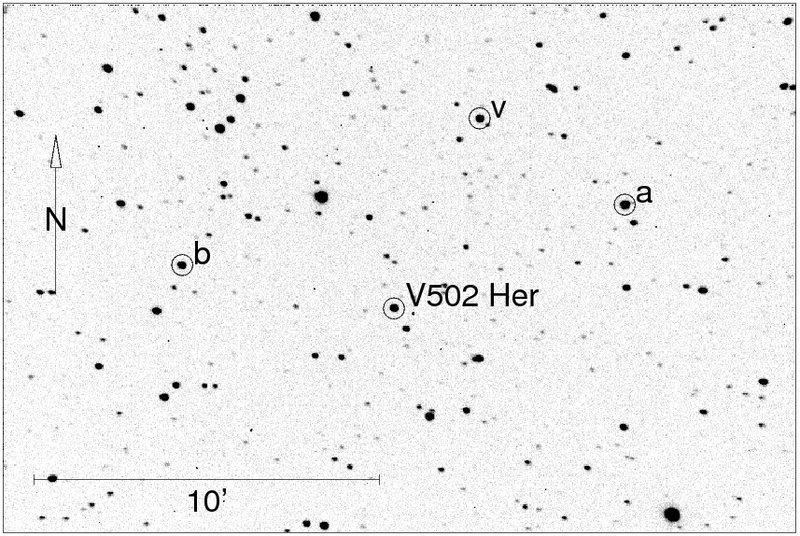 In the field of V502 Her, discovered in 2009. 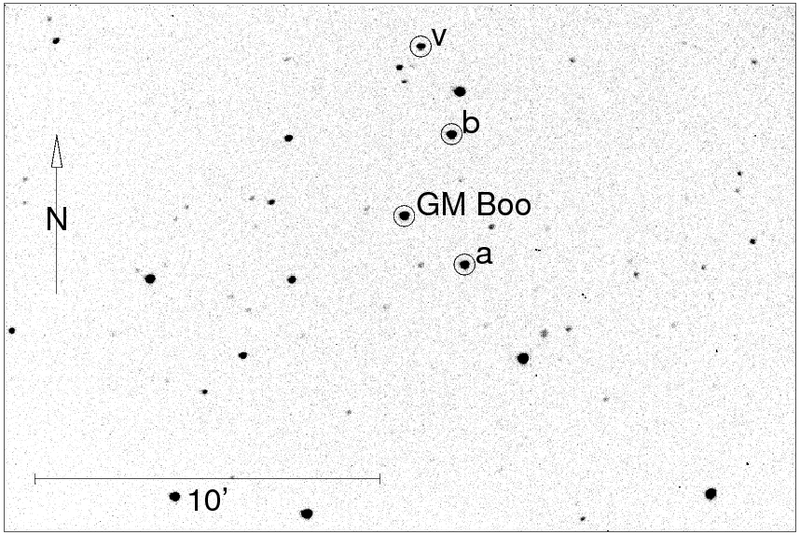 Comparison star: a = GSC 2610-00262. 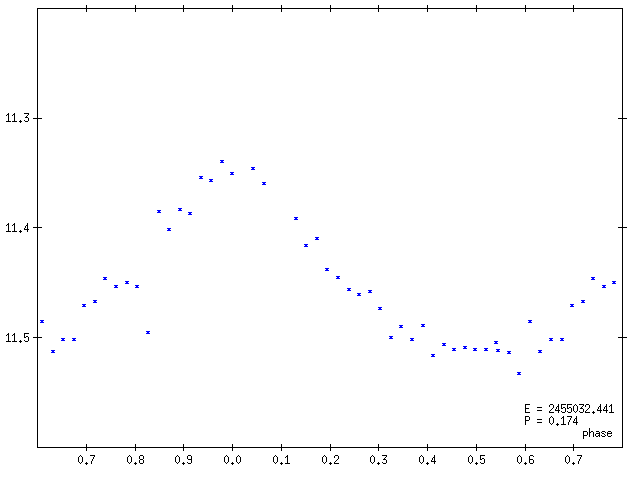 Check star: b = GSC 2610-02091. The tabulated period is not the only possible one. 11. 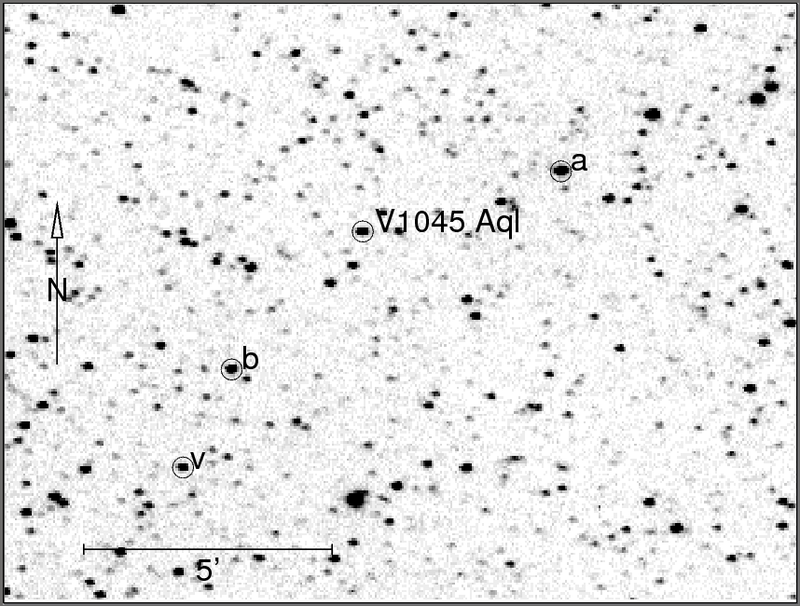 In the field of V1045 Aql, discovered in 2007. 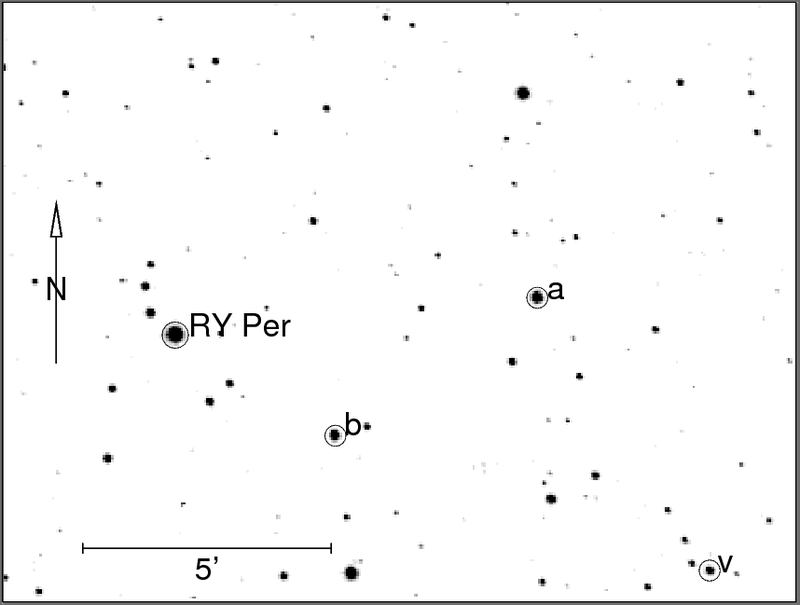 Comparison star: a = GSC 1615-00641. 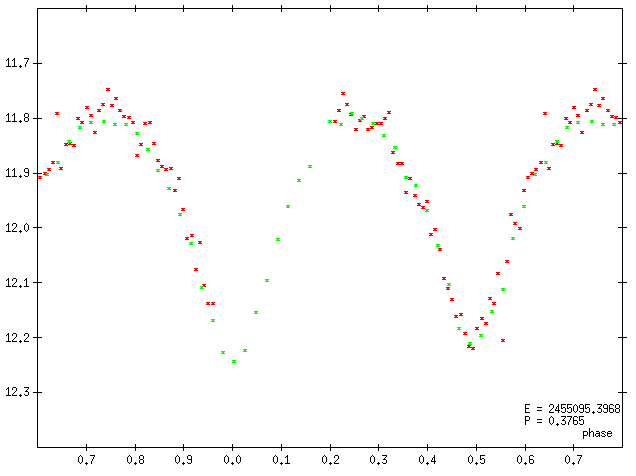 Check star: b = GSC 1615-00338. 12. In the field of TU Sge, discovered in 2005. 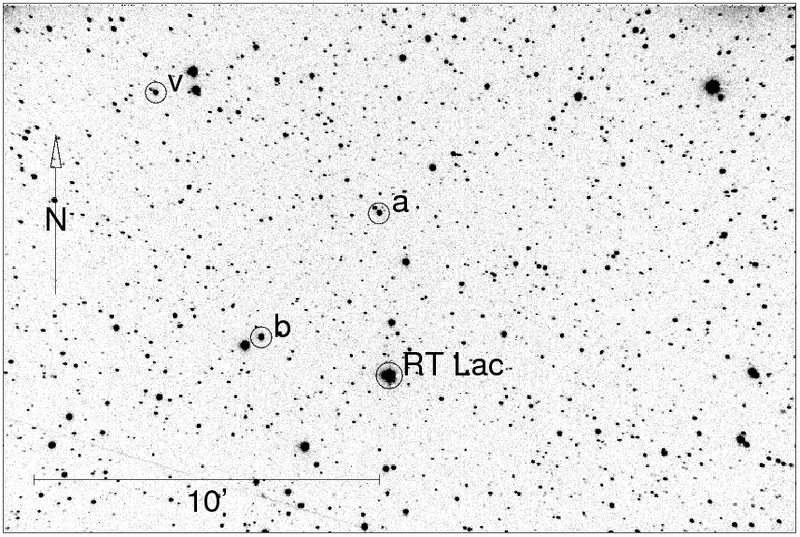 Comparison star: a = GSC 1624-01346. 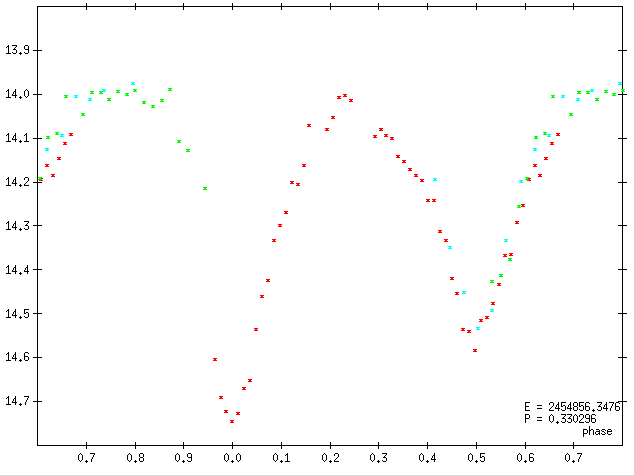 Check star: b = GSC 1624-00532. Three minima could be observed in 2005 and 2006. MinII = 14.5. The tabulated period is not the only possible one. 13. 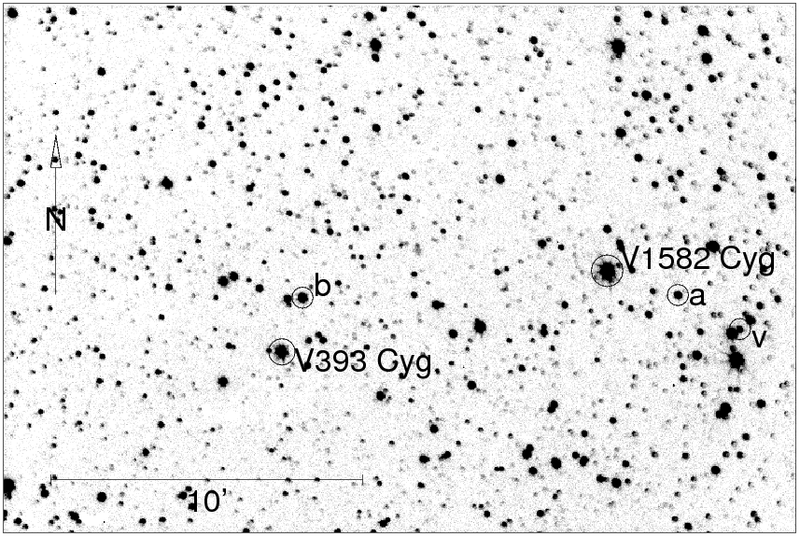 In the field of V393 Cyg and V1582 Cyg, discovered in 2008. 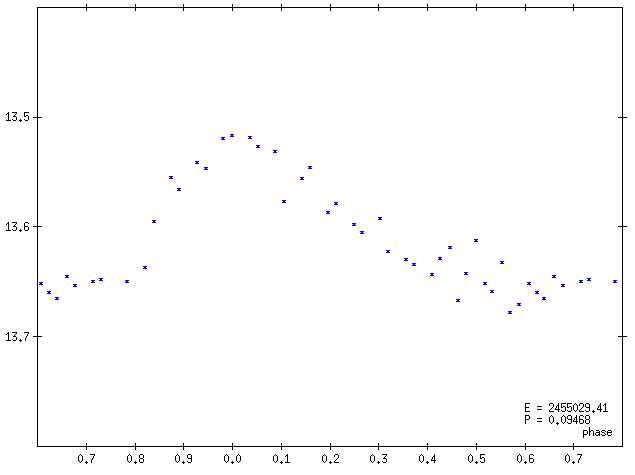 Comparison star: a = USNO-B1.0 1333-0373119. 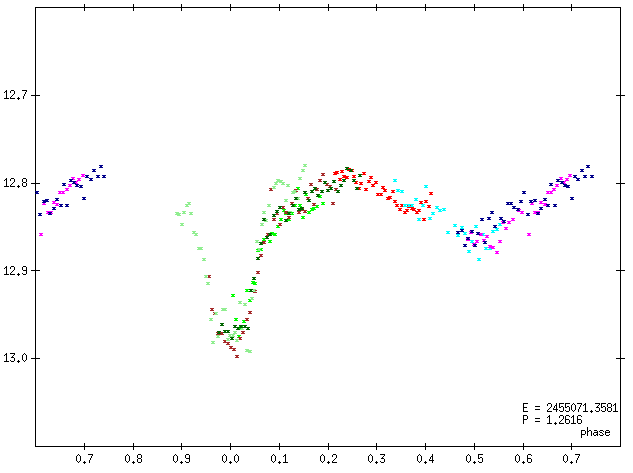 Check star: b = GSC 3149-01697. Two minima could be observed in 2008. MinII = 14.35. 14. 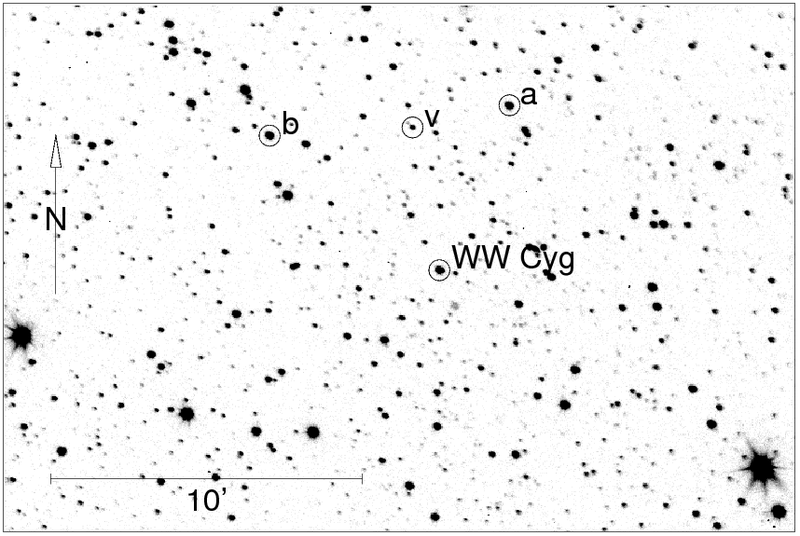 In the field of WW Cyg, discovered in 2008. Comparison star: a = GSC 3158-01188. 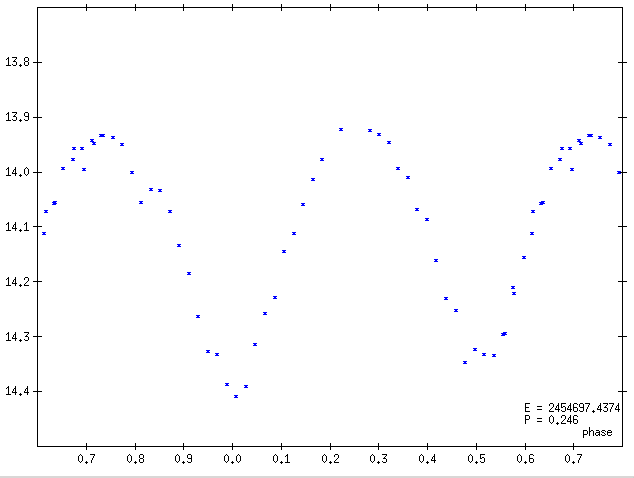 Check star: b = GSC 3158-00794. Four minima could be observed in 2008 and 2009. MinII = 13.65. 15. 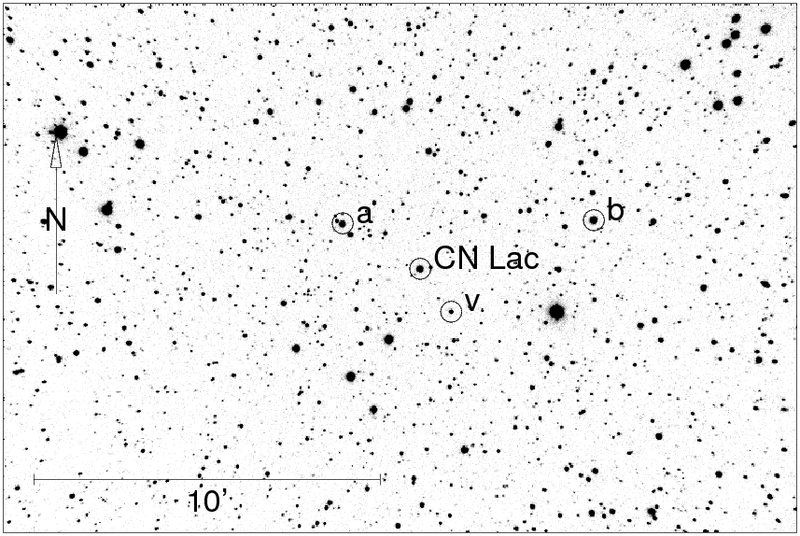 In the field of V1034 Cyg, discovered in 2005. 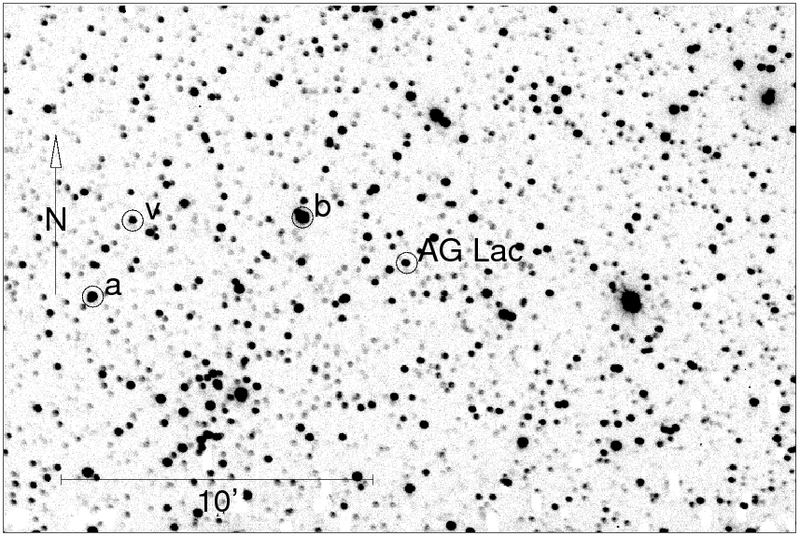 Comparison star: a = GSC 2671-02415. 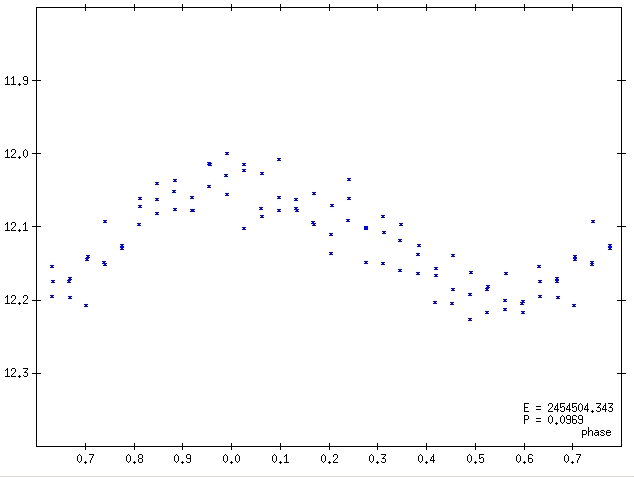 Check star: b = GSC 2670-01960. Three maxima in 2005 and three maxima in 2009 could be observed. The amplitude seems to vary. 16. 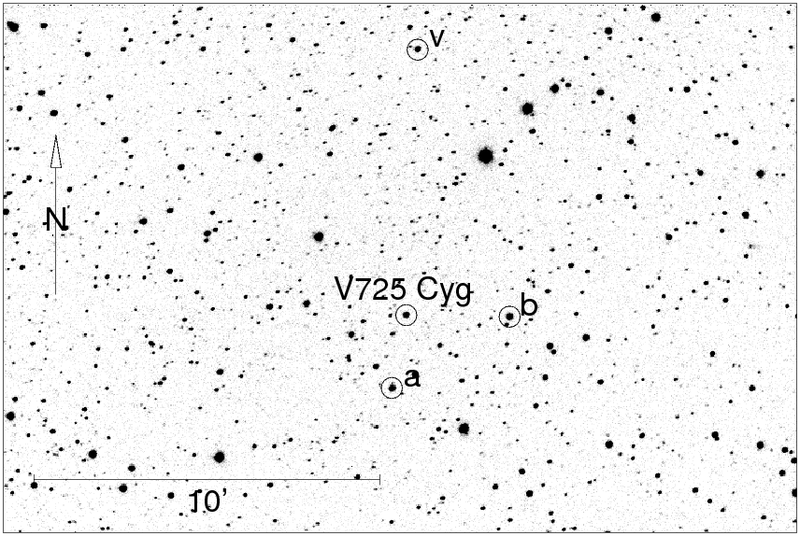 In the field of V725 Cyg, discovered in 2008. 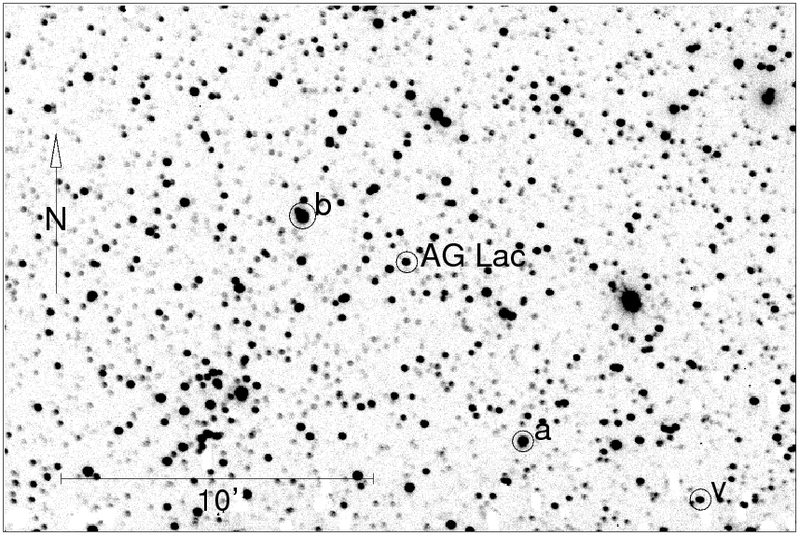 Comparison star: a = GSC 2671-02107. 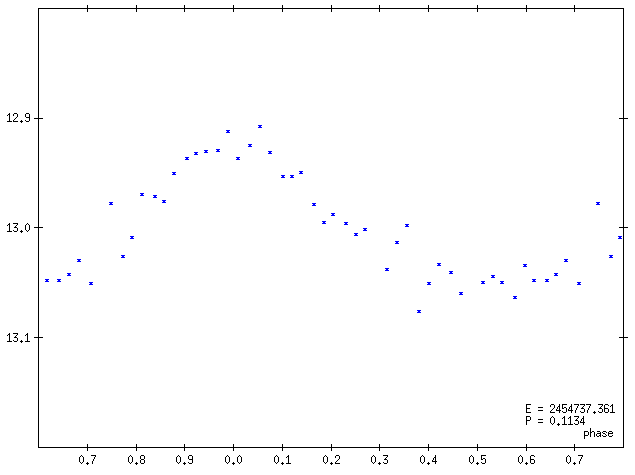 Check star: b = GSC 2671-01906. Two maxima could be observed. 17. 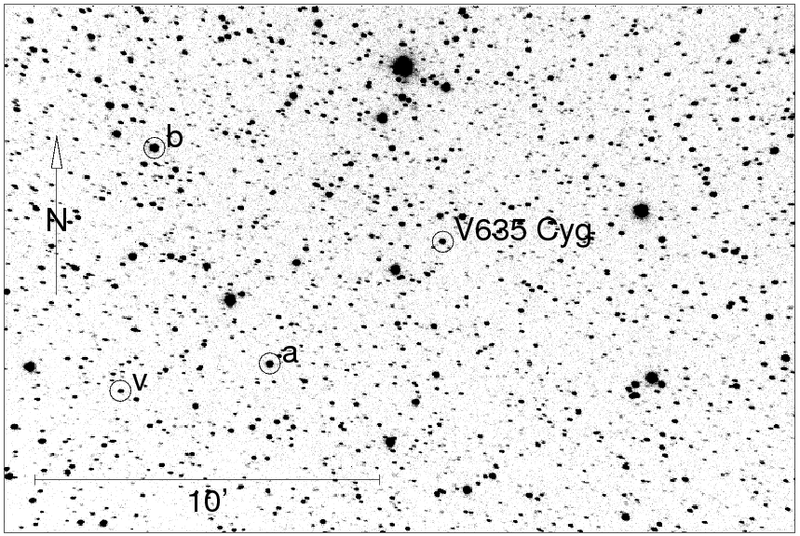 In the field of V635 Cyg, discovered in 2009. Comparison star: a = GSC 3595-00740. 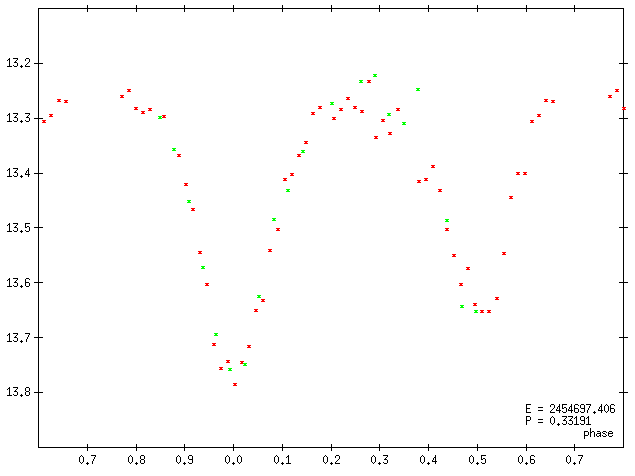 Check star: b = GSC 3595-00781. 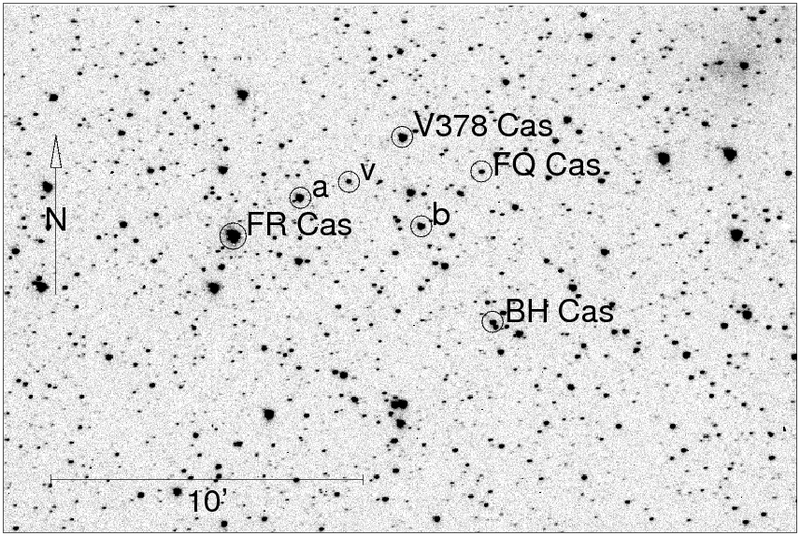 The variable was observed during 8 nights in 2009. 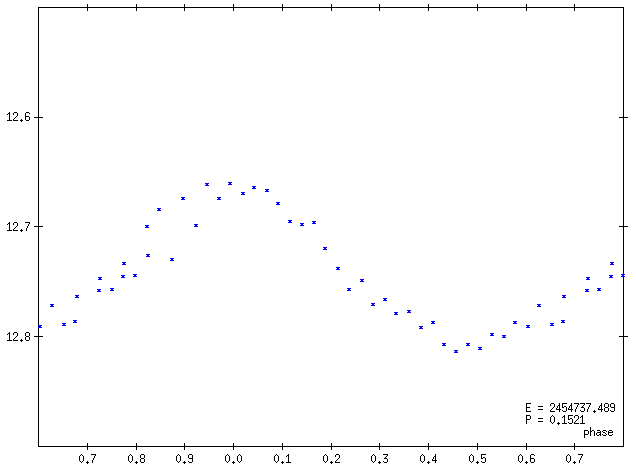 The pulsations vary strongly in amplitude and vanish sometimes. 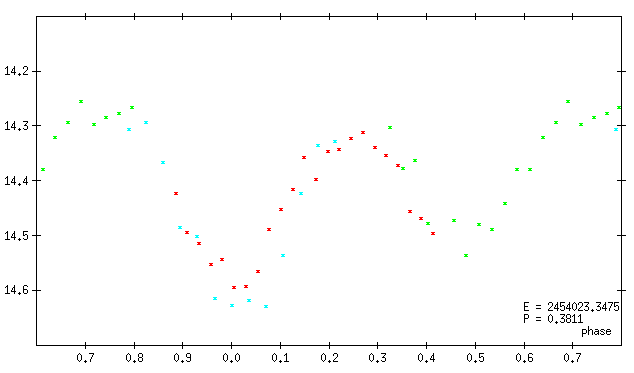 This variable is possibly multiperiodic. 18. 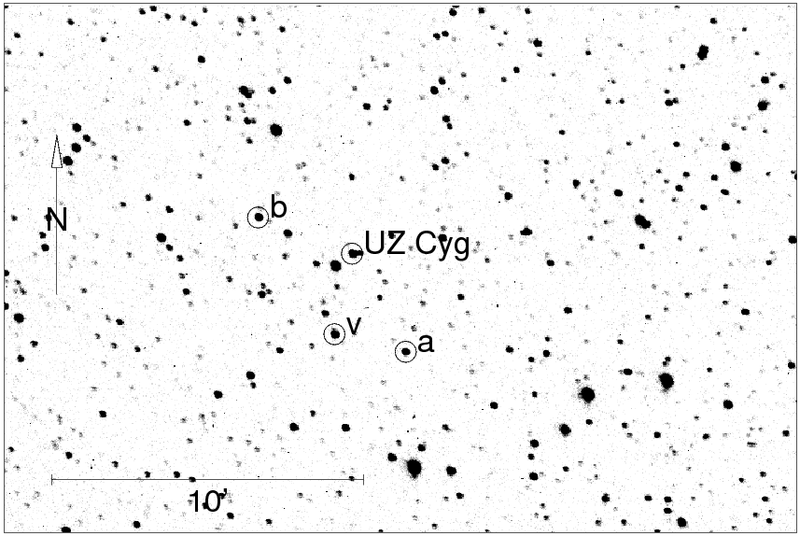 In the field of UZ Cyg, discovered in 2007. Comparison star: a = GSC 3197-00473. 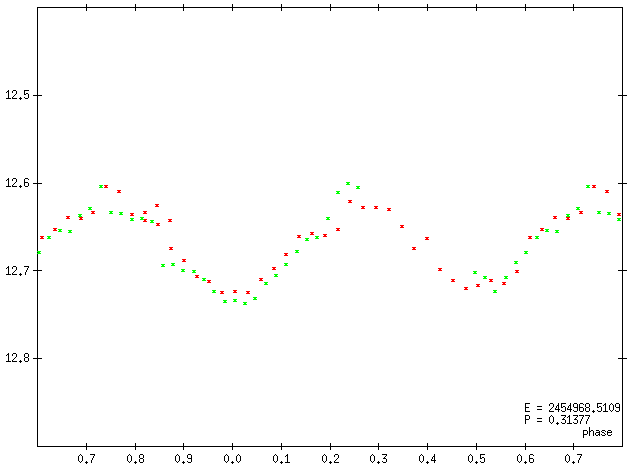 Check star: b = GSC 3197-00537. One maximum could be observed in 2007, and two in 2009. The amplitude is varying. 19. In the field of RT Lac, discovered in 2009. Comparison star: a = GSC 3210-00238. Check star: b = GSC 3210-00592. Five minima could be observed in 2009. MinII = 12.22. 20. In the field of CN Lac, discovered in 2008. Comparison star: a = GSC 3605-02646. 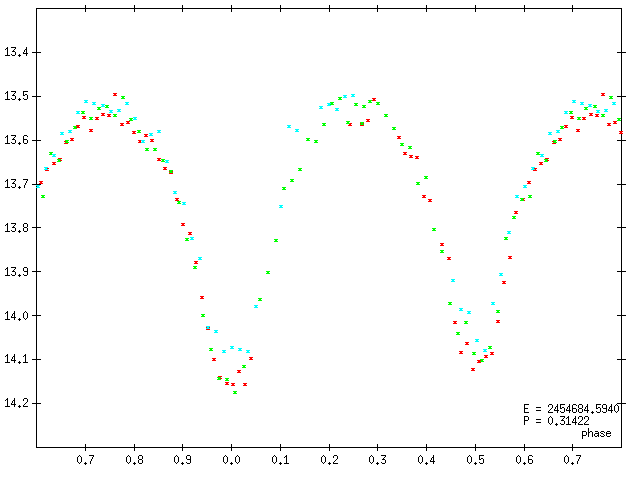 Check star: b = GSC 3605-02642. Five minima could be observed in 2008 and 2009. MinII = 12.87. 21. In the field of ZZ Lac, discovered in 2004. Comparison star: a = GSC 3619-00083. Check star: b = GSC 3619-00255. Two minima could be observed in 2004. MinII = 12.56. 22. In the field of MP Lac, discovered in 2009. Comparison star: a = GSC 3615-02917. 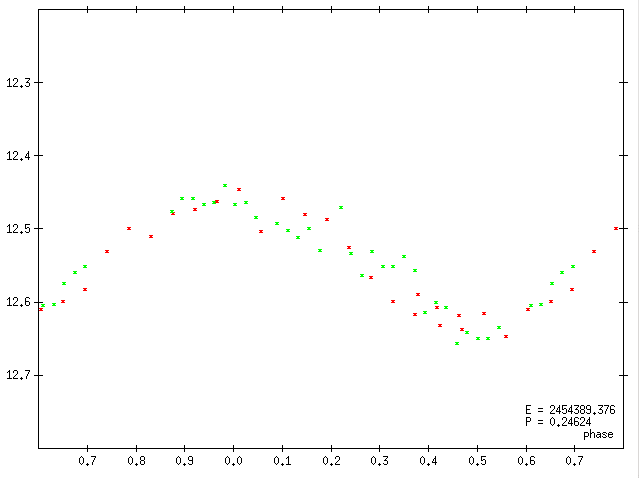 Check star: b = GSC 3615-02916. Three minima could be observed in 2009. MinII = 14.9. 23. In the field of AG Lac, discovered in 2008. Comparison star: a = GSC 3619-01158. Check star: b = GSC 3619-00264. Three maxima could be observed between on one night. 24. In the field of AG Lac, discovered in 2008. Comparison star: a = GSC 3619-00620. Check star: b = GSC 3619-00264. Four maxima could be observed in 2008 and 2009. EW type with twice longer period is possible. 25. 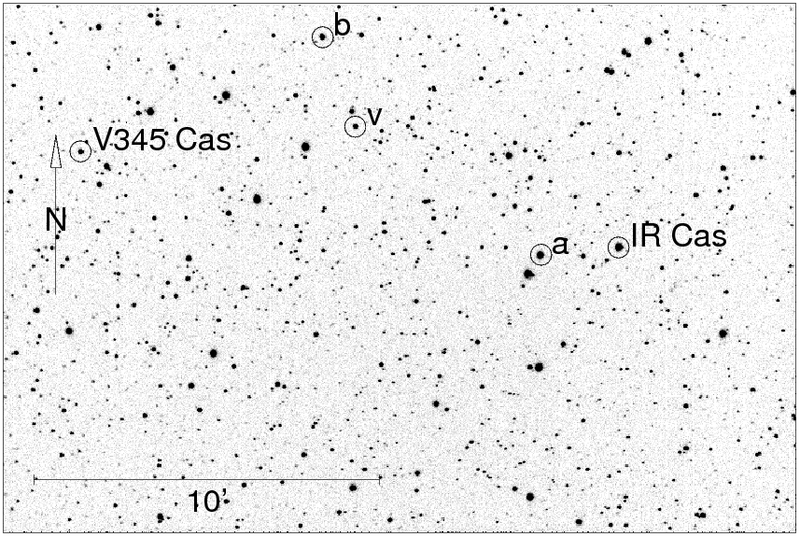 In the field of IR Cas and V345 Cas, discovered in 2008. Comparison star: a = GSC 3998-01901. 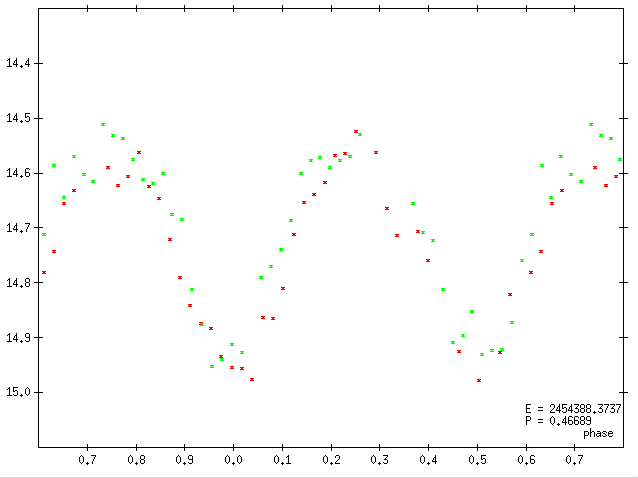 Check star: b = GSC 3998-01997. Five minima could be observed in 2008 and 2009. MinII = 13.02. 26. In the field of IS Cas, discovered in 2008. 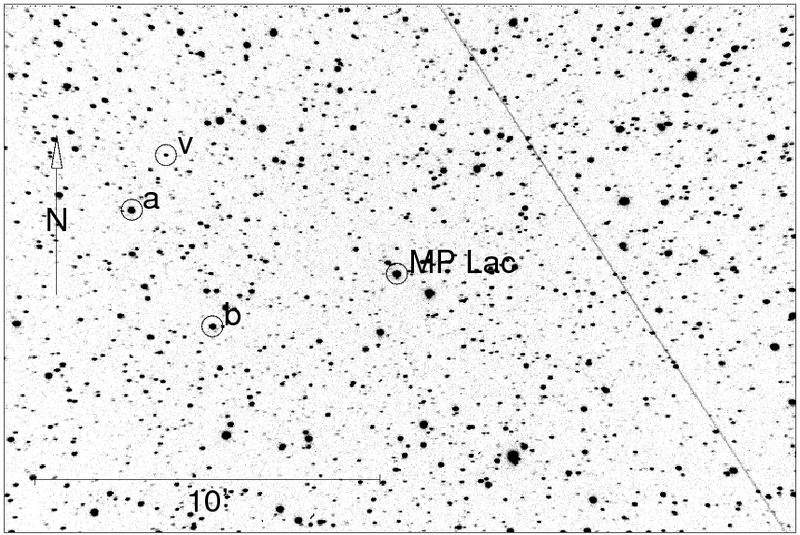 Comparison star: a = GSC 4280-02085. 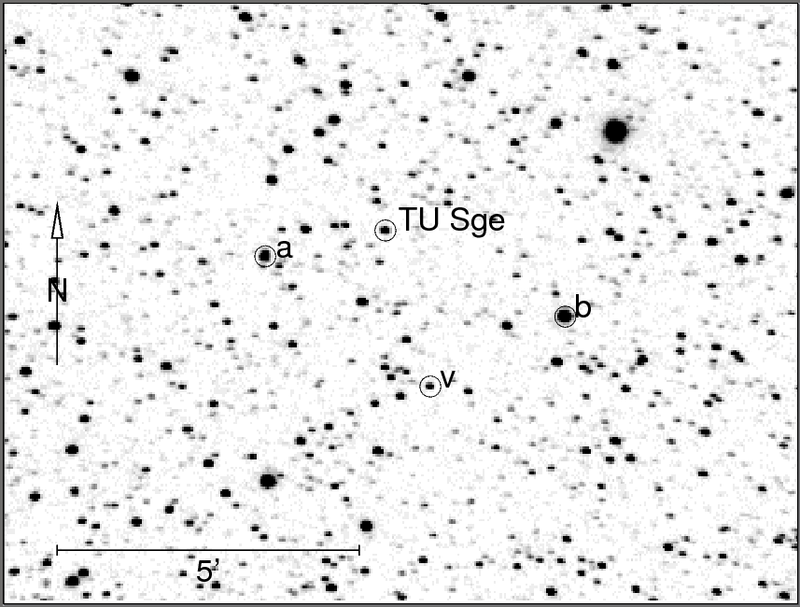 Check star: b = GSC 4280-01600. The periods 0.314218 and 0.311336 seem to fit the data almost equally well. Five minima could be observed in 2008 and 2009. MinII = 14.10. This is a continuation of my recently published paper (Agerer 2010). 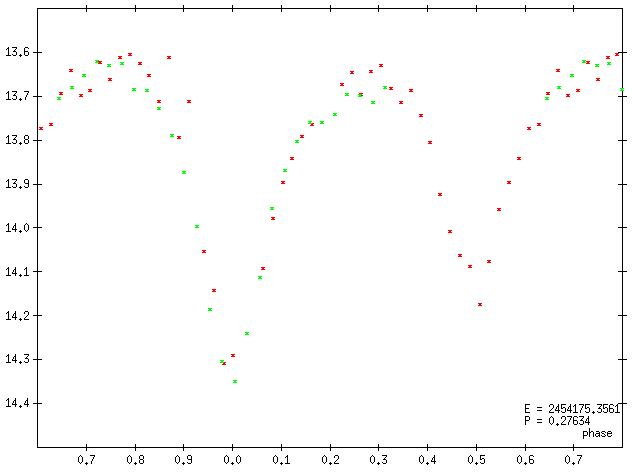 In the course of my investigation of known variable stars on a regular basis, nearby stars are sometimes detected as variables. The observations were carried out with two semiautomatic telescopes, 8-inch and 14-inch Schmidt-Cassegrain ones, operated at my private observatory. Before 2008, both telescopes were equipped with cooled SBIG ST6 CCD-cameras. Beginning with 2008, these cameras were replaced with SIGMA 1603 cameras, containing a cooled Kodak KAF1603ME chip. Normally, the exposures are 60s through a minus-Ir filter. 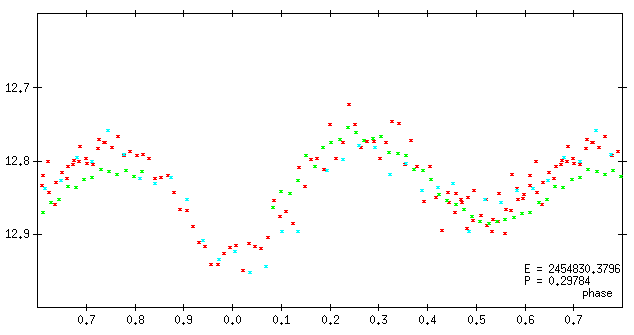 Differential magnitudes are calculated using a comparison star ("a" in the charts) with a B-R color index resembling that of the variable. The constancy of the comparison is controlled using several check stars in the field, one of them is labeled "b" in the charts. 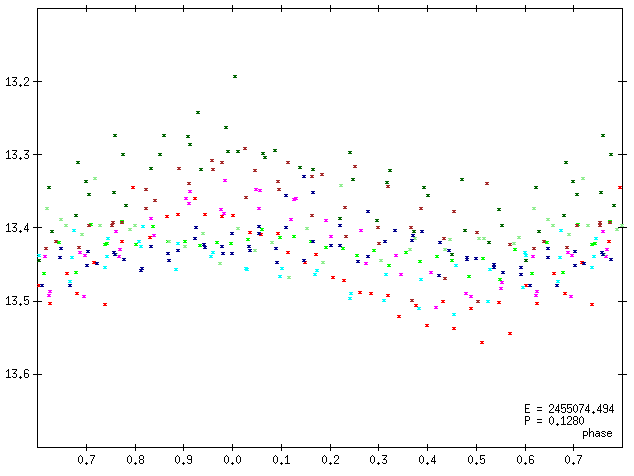 Rough instrumental magnitudes are calculated simply by adding the R-magnitude of the comparison star taken from the USNO-B1.0 catalogue to the differential magnitudes. The coordinates are also taken from the USNO-B1.0 catalogue. Concentric aperture photometry is carried out by means of a self-written program, after bias, dark- and flatfield correction of the exposures. 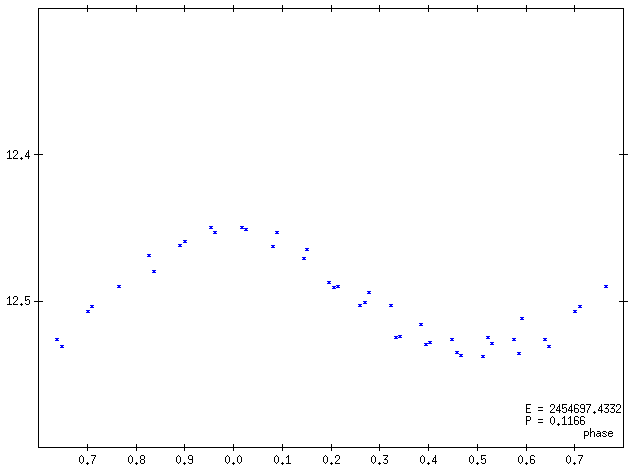 Least squares ephemerides are not given, as too few timings of extrema could be calculated from my observations. Acknowledgements: I would like to thank S.V. Antipin and N.N. Samus for their helpful discussion. 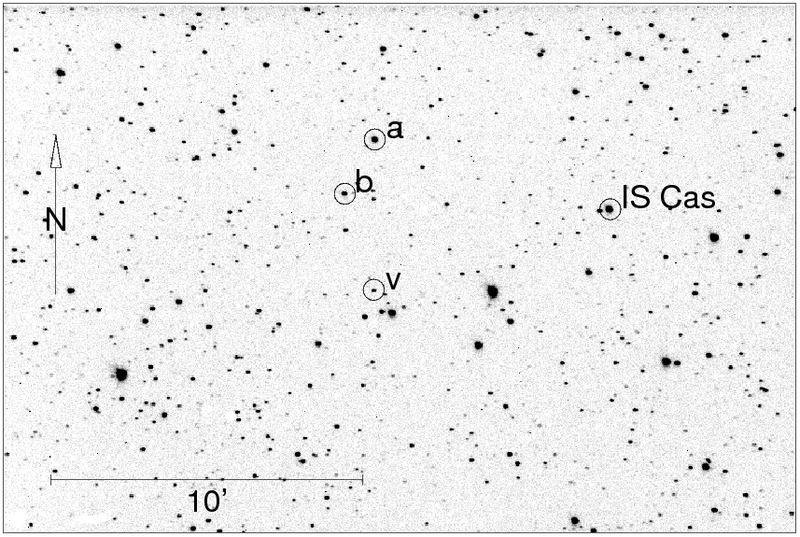 This research has made use of the SIMBAD database, operated at CDS, Strasbourg, France and of the The International Variable Star Index (VSX) operated by the American Association of Variable Star Observers (AAVSO).